The Boeing B-17 is arguably the most famous American bomber of World War II. Featured in such film classics as Twelve O’Clock High and The War Lover, the B-17 often overshadowed the more prolific Consolidated B-24. When it was first conceived, the B-17 was not considered for the role of a strategic bomber, but instead as a defensive weapon designed to sink ships off the coast of the United States. When the USAAC issued a requirement for a new multiengine bomber in 1934, Boeing took the term “multiengine” to mean four. In June 1934 work on the Model 299 began and the prototype first flew on July 28, 1935. A local paper nicknamed the new bomber the “Flying Fortress” and it stuck. Climb into the cockpit of the Flying Fortress with author Donald Nijboer in his new book, Fighting Cockpits: In the Pilot’s Seat of Great Military Aircraft from World War I to Today. When the B-17B entered service, it was the fastest, highest flying bomber in the world. At the same time the USAAC was developing its long-range strategic-bombing program, believing that massed formations of self-defending B-17s would make it to the target without suffering heavy losses. The B-17 first saw combat with the RAF beginning in July 1941. Its defensive armament, however, could not be described as fortress-like. The B-17C was armed with two handheld .50-caliber guns in the dorsal position, two in the ventral position, one .303-caliber flexible gun in the nose, and two .50-caliber guns in the waist positions. The RAF wanted to use the B-17 as a high-altitude bomber in the hopes of avoiding enemy fighters, but the results were not good. The guns had a tendency to freeze at high altitudes and the Norden bombsight did not live up to expectations. Losses to fighters and accidents steadily grew until just four of the original twenty B-17s remained. An extensive redesign was ordered and the first, truly combat-ready B-17 was the E model, equipped with a Sperry top and remote lower turret (soon replaced by the Sperry ball turret), tail turret, two guns in the waist, and two in the nose. The next variant to enter service, the B-17F, incorporated hundreds of changes, including new fuel tanks and more armor. The B-17F also bore the brunt of early deep-penetration raids into Germany. Against stiffening fighter resistance, aircraft losses frequently rose above 10 percent. It also became clear that the B-17s, like the B-24s, were vulnerable to head-on attacks. The B-17G attempted to solve that problem with the addition of the Bendix chin turret operated by the bombardier. In the end the introduction of long-range escorts enabled the Eighth and Fifteenth Air Forces to continue using this aircraft for the daylight bombing of Germany. The B-17 cockpit is incredibly unique. A lot of cockpits look similar, but the B-17 is totally different. No other airplane that flies today has that throttle quadrant. Every other airplane has a throttle you grab at the top. In the B-17 you handle the throttles from underneath, using your underhand. Grasp the top rung and engines one and four will respond, while the bottom rungs give you two and three. The split middle rung gives all four at once and is therefore used the most. It takes a while for new B-17 pilots to remember to turn their hands. The other thing you have to be aware of is the mixture controls. In most aircraft, to increase fuel mixture, you push the control forward; to increase power in the B-17 you move the throttles forward and the mixture controls back. It’s counterintuitive. You could easily shut off all four engines if you’re not paying attention. The view from the cockpit is very good. I’ve got limited time in the B-24 but in comparison, the B-17 is much better. You have a low wing behind you and the cockpit sits past the leading edge. The only obstruction is over the nose. The celestial navigation dome can block your view, but otherwise visibility is outstanding. The cockpit noise level is comfortable. Compared to the B-25, which is the loudest aircraft I’ve ever flown, the B-17 is very good. When it comes to overall comfort, however, it’s not great. We don’t fly the B-17 at 20,000 or 30,000 feet (6,096 or 9,144 meters)—6,000, 7,000, or 8,000 feet (1,829 to 2,438 meters) is the norm, and after flying for two or three hours, it gets pretty darn cold. It’s the coldest I’ve ever been. It gives you a lot more respect for the guys wearing the heated suits flying around at 30, 40 below zero (?1 to ?4 degrees Celsius) at 30,000 feet. The B-17 is a two-pilot airplane. The workload in the cockpit is relatively straightforward. The pilot in command does most of the work with the copilot checking the gauges to make sure everything is within limits. The controls are heavy. There’s no boost, just cables and pulleys. It will wear you out. At the same time the B-17 was comfortable and easy to fly, that’s why they gave it to nineteen-years-olds with just one hundred hours. You have to respect those young men flying formation for hours while dodging German flak and fighters. The B-17 does not have a mean bone in its body. It will embarrass you, however, especially when you bounce it on the runway for the first time. When the war started the B-17 was somewhat obsolete. Built with 1930s technology, the cockpit was still very useful. The wartime instrument-panel configuration was very good. It’s logical, easy to read; I wouldn’t change a thing. If it wasn’t for a bullet, bomb, or gas they didn’t leave a lot of room for comfort. It was one of the best military aircraft ever built. I love every part of flying the B-17. It was put together right. Climb inside the cockpits of the world’s most famous military aircraft from World War I, World War II to the present day! What was it like to sit in the pilot’s seat and take control of a P-51 Mustang in World War II? What about an F-14 Tomcat at the height of the Cold War? Or a Lockheed Martin F-22 Raptor today? The cockpits of these fighter and bomber aircraft are revealed in Fighting Cockpits. 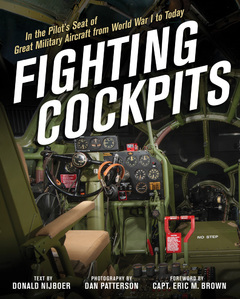 Showcasing more than 50 of the world’s most famous combat cockpits from early World War I aircraft to present-day fighters, this book includes more than 200 rich color photos from photographer Dan Patterson, as well as detailed history about combat cockpit development from aviation expert and historian Donald Nijboer. In the beginning of the twentieth century, aircraft had open cockpits. Pilots during World War I had to bundle up with fleece-lined leather coats, sheepskin thigh boots, and woolen underclothing to avoid freezing in the cold air four miles up. There was no heating, no oxygen for high flying, no retractable undercarriage, no engine starter, no radio links with air or ground, no brakes to help with landing, and no parachutes. The pilot was afforded merely left and right foot pedals to control the rudder and a single central control stick to cause the nose of the plane to pitch up or down. Since then, the cockpits of fighters and bombers have seen quite an evolution, and the chronology is represented in Fighting Cockpits. Presented in large-format volume, this book will complete any history buff or aviation enthusiast’s library. Donald Nijboer is an aviation author, historian, a documentary writer/producer, as well as a college instructor and Smithsonian speaker. His articles have appeared in Flight Journal, Aviation History, and Aeroplane Monthly. Donald lives in Toronto, Canada. Dan Patterson is an accomplished photographer who has excelled in the fields of portraiture, architecture, and aviation. His work has been featured in 23 books, and in 2003 he received the first annual Harry B. Combs Award from the National Aviation Hall of Fame for Excellence in the Preservation of Aviation History. The National Portrait Gallery in London selected five of his portraits of British aviators to be included in their permanent collection. In addition, he has served as an aviation lecturer for the Smithsonian Journeys program. Dan lives in Dayton, Ohio.